Every year on Aug. 30, Chairman Fred Hampton Jr. and the Prisoners of Conscience Committee/Black Panther Party Cubs organize a birthday celebration for Chairman Fred Hampton Sr., the Black Panther Party leader in Chicago who was assassinated by the Chicago Police Department in a pre-dawn raid on Dec. 4, 1969, along with Defense Captain Mark Clark. The Chairman Fred Streetz Party always kicks off at noon at Ground Zero, 2337 W. Chairman Fred Hampton Sr. Way (aka “Monroe St.”), with Comrade Mother Akua Njeri giving her harrowing account of the CPD death squad raid at that address. 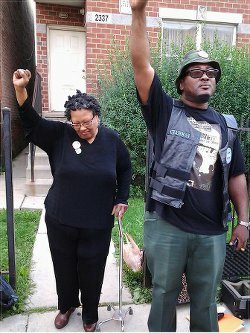 Comrade Mother Akua Njeri and Chairman Fred, Jr. in front of 2337 W. Monroe. 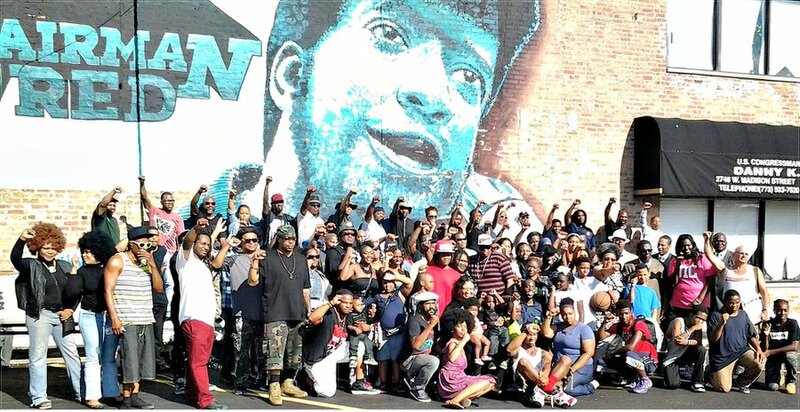 Revolutionaries and supporters of the Black national liberation struggle come from all around the country and all around the world for the Streetz Party, with this year’s crowd being one of the biggest in years. Shooting continued on the APJ Films movie being made about Chairman Fred Sr.’s assassination. Preceding this was a revolutionary speech by Chairman Fred Jr. on the theme “Who/What Created Chiraq?” — a reference to the violent conditions created in the Black community in Chicago by the neocolonial occupation by the CPD, and Chicago Mayor Rahm Emmanuel’s attempt to pull the plug on public education. Chairman Fred Jr. spoke about the mass incarceration of Black youth in the U.S. prison system, which he referred to as “concentration camps,” part of a POCC/BPPC policy of “using brutal terms to describe brutal realities.” He also spoke about his time in these camps as a political prisoner and his experiences educating fellow captives about the revolutionary politics of the Black Panther Party. He also spoke about the recent events in Ferguson, Mo., making the point that what has unfolded during the past several weeks is not a “riot” — as the corporate media call it — but a rebellion against the intolerable conditions that the neocolonial occupation has imposed on the Black community. The chairman denounced the “charlatans and Sharptons” who try to divert the uprising into channels controlled by the Democratic Party, saying of the role of the POCC/BPPC, “We aren’t divisive, we simply expose the contradictions.” He went on to make comparisons between the uprising in Ferguson and the Palestinian people’s resistance to Zionist colonialism in Gaza. 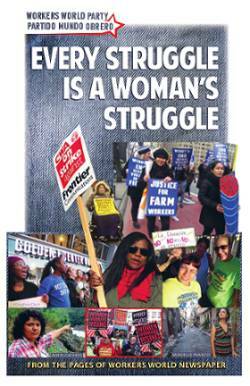 Revolutionary greetings and a message of solidarity were delivered by representatives of Workers World Party, L.Y.R.I.C. (Let Your Rhymes Inspire Creativity) Squad, the Nation of Islam and the Freedom House Academy. After the rally at Ground Zero (“where we had our own 9/11, where police terrorism took out our Twin Towers, Chairman Fred and Defense Captain Mark Clark”), Chairman Fred Jr. led a tour of the neighborhood to spots where the Panthers used to drill, leading over to the mural of Chairman Fred Sr. by the Rebel Diaz Arts Collective at The Wall, on Madison and California. The Streetz Party continued at The Wall, where people were barbecuing and listening to disc jockeys and performances by L.Y.R.I.C. Squad and a former member of the seminal 1990’s Chicago hip-hop group Psychodrama. This was one of the most successful Streetz Party events the POCC/BPPC has had in years, and they look forward to even more people attending International Revolutionary Day (commemorating the martyrdom of Chairman Fred Sr.) on Dec. 4 and next year’s Streetz Party. Those interested can keep up with POCC/BPPC events at chairmanfredjr.blogspot.com.